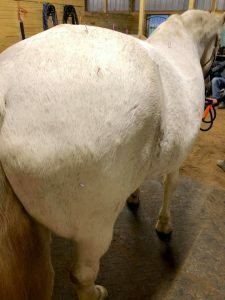 Acupuncture was used to treat stifle lameness in a retired horse who had been turned out to pasture due to lameness that had not responded to standard therapy of nonsteroidal anti-inflammatories (phenylbutazone). While the patient’s lameness was not eliminated, the patient’s mobility and quality of life did improve significantly after five treatments of dry needling. Rose is a twenty three year old Irish Sporthorse who was retired approximately five years ago due to a left stifle lameness. Per the owner, the lameness was worked up by the primary care veterinarian, localized to the stifle, and radiographs were taken. Unfortunately, radiographs were unable to be obtained. Rose was initially treated conservatively with phenylbutazone, but had not received any treatment for several years due to lack of improvement noted by the owner. The current owner acquired the horse about ten years ago, and the mare was used in dressage lessons and schooling shows for several years prior to her retirement. She does not have any other medical history apart from her lameness. Her previous occupation and health history is not well known. On initial presentation, the patient was mildly over conditioned (body condition score 7/9) and appeared to be in good general health. The patient was over at the knee on the right forelimb, and the right carpus was moderately thickened compared to the left, with no palpable effusion. The left tuber sacrale was noted to be significantly taller than the right, and there was a moderate amount of effusion in the left femoro-patellar joint. The patient was a grade 4/5 lame on the left hindlimb, and a grade 1/5 lame on the right forelimb (based on the American Association of Equine Practitioners lameness scale). The cranial phase of stride of the left hindlimb was about one quarter to one half of the cranial phase of the right hindlimb at the walk, and the left hindlimb had a “stabbing” quality consistent with stifle lameness. At the trot, a consistent sacral rise was appreciated. Neurologic examination was within normal limits, no muscle atrophy was appreciated, and the patient was not observed to stumble or misplace her feet when being evaluated on a straight line of travel or on the lunge line. Myofasical palpation revealed diffuse tension and fascial restriction over the neck and trunk. Cervical flexion was limited caudal to the third cervical vertebrae bilaterally. Lateral spinal bending was stiff in the mid thoracic region bilaterally, but more prominently to the right. The patient was painful on cranial rotation of the scapulae. The most striking areas of discomfort on the diagnostic acupuncture exam were ST 10, BL 18, and BL 25. The gluteals were also diffusely painful. Differentials for stifle lameness include aortic-iliac thrombosis, cellulitis, synovial cell sarcoma, osteoarthritis, joint flare, osteochondrosis, equine fibromyalgia syndrome, soft tissue injury (including the menisci, ligaments, and muscle), upward fixation of the patella, and trigger point pathology. Differentials for carpal lameness include hematogenous septic arthritis, synovitis, carpal bone osteitis, septic bursitis, hypertrophic osteopathy, osteoarthritis, cadmium toxicity, flexural limb deformity, infarctive purpura, slab fractures of carpal bones, nutritional secondary hyperparathyroidism, and trigger point pathology. Osteoarthritis or soft tissue injury is suspected to be the most likely cause of the patient’s stifle lameness given her age and the swelling associated with the stifle joint. Joint flare can be ruled out due to no history of joint injections, and a congenital cause is highly unlikely in a geriatric horse. No episodes of upward patellar fixation were noted on serial exams. Osteoarthritis or a flexural limb deformity are the putative diagnoses for the patient’s carpal lameness. The mild carpal flexural deformity present may be congenital or acquired. A greater amount of soft tissue swelling would be expected with an infectious etiology. While trigger point pathology is likely a contributing factor, concurrent pathology is suspected in both limbs given the joint effusion in the left stifle and the conformation of the right carpus. Further diagnostics (radiographs, arthrocentesis, ultrasound, arthroscopy) are indicated to reach a definitive diagnosis. The initial treatment was geared towards creating relaxation and targeting nerves supplying the stifle. LI 16 and Bai Hui were needled initially to determine patient response to needling; Bai Hui also stimulates mid-caudal lumbar spinal nerves supplying the pelvic limb and neuromodulates by creating an increase in parasympathetic tone. GB 21 was used to address myofascial restriction in the neck, as well as pain on cranial rotation of the scapulae. BL 21 was chosen to address myofascial restriction of the thoracic and lumbar regions. BL 25 was chosen to stimulate mid-lumbar spinal nerves supplying the stifle, and the hip triad (BL 54, GB 29, GB 30) was needled to alleviate gluteal pain. Placement of additional needles at subsequent treatments was based on changes in the patient’s gait and myofascial exam, as well as trigger points noted at each session. Distal limb points targeting the stifle more locally (BL 40, ST 36) were added at subsequent sessions. Length between sessions was based on patient response and how long benefits lasted between sessions. Treatment 1: Points treated included GB 21, LI 16, BL 21, BL 25, Bai Hui, BL 54, GB 29, and GB 30. Pre-treatment exam (two weeks from initial treatment): The owner reported a visible difference in the patient’s demeanor for several days after the treatment, and the patient was trotting in the pasture. There were no changes to the assessment of the left stifle. The right carpus had mild-moderate effusion, and the patient was more obviously lame on the right forelimb (grade 3/5). Myofascial restriction was markedly improved. Lateral cervical bending was improved at C3-C4, but remained stiff caudal to C4. The patient was mildly resistant to circular movement of the hind limbs while in extension, suspected to be due to iliopsoas pain. Pain was appreciated at ST 10, along the lumbar spine, and the gluteals bilaterally. Treatment 2: Points treated included GB 21, ST 10, GV 14, Bai Hui, BL 18 (at both the 13th and 14th intercostal space), BL 21, BL 25, BL 26, BL 27, BL 54, GB 29, GB 30, BL 40, and ST 36. Pre-treatment exam (ten days from last treatment): The owner noted that the patient was cantering on the left lead in the pasture, and her demeanor had again improved. There was no obvious lameness in the right front. The left hind lameness remained a grade 4/5, but the patient was much more willing to move forward. No myofascial restriction was appreciated on palpation. Lateral cervical bending was within normal limits. Spinal bending was within normal limits to the left, but was decreased in the mid thoracic region to the right. Treatment 3: Points treated included GB 21, ST 10, GB 14, Ah Shi point identified in the triceps bilaterally, Bai Hui, BL 18 (at the 14th intercostal space), BL 21, BL 25, BL 26, BL 40, ST 36, and Ah Shi points in the gluteals (four total needles in the right gluteals, and five needles in the left gluteals). Pre-treatment exam (ten days from last treatment): The owner noted general relaxation for the next 24 – 48 hours following the previous treatment. The patient had also galloped in the field following the treatment, but after this event, had only been trotting up slowly from the field. A superficial appearing laceration of the left front medial heel bulb was noted. The patient appeared bilaterally lame in the front end, with a short choppy stride. There was mild effusion in the right carpus, and the pastern and hoof of the left forelimb were warm to the touch. There was a greater amount of myofascial restriction compared to previous exam, but the trigger points in the gluteals were improved. Trigger points were noted in the pectorals and triceps. Treatment 4: Points treated included GB 21, ST 10, BL 10, Ah Shi point in the pectorals bilaterally, Ah Shi point in the triceps bilaterally, Bai Hui, BL 21, BL 25, BL 26, BL 27, BL 40, ST 36, Ah Shi points in the gluteals (2 points in the right gluteals, 3 points in the left gluteals). 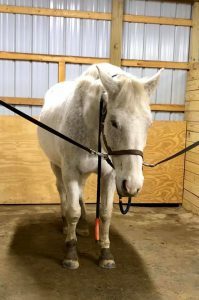 Pre-treatment exam (three weeks from last treatment): The owner again reported that the patient had been cantering on both leads and galloping in the pasture. The hind end lameness and stifle effusion remained static, but the patient was more willing to move forward. The bilateral forelimb lameness noted at the last visit was resolved. Lateral cervical bending and lateral mobility of the thoracic and lumbar spine were within normal limits. There was no resistance to cranial motion of the scapulae. Mild pain was identified at the area of BL 20 on the right side, as well as at BL 18 and along the lumbar spine on the left side. The tuber sacrale were nearly symmetrical, with the left being only slightly taller than the right. Treatment 5: Points treated included LI 16, ST 10, Ah Shi points in the triceps (1 point in the right long head of the triceps, 2 points in the left long head of the triceps), Bai Hui, BL 20 on the right, BL 18 (15th intercostal space) on the left, BL 21, BL 25, BL 26, Ah Shi points in the gluteals (2 points in the right gluteals, 3 points in the left gluteals), BL 40, and ST 36. After the last treatment, the patient was noted to begin stretching over the topline while on the lunge line. Unless otherwise noted, all points were treated bilaterally. For each treatment, Seirin 0.25 x 30 mm needles were used, except for midline points, which were needled with Seirin 0.30 x 30 mm needles. Needles were left in place for 20 – 30 minutes at each session. 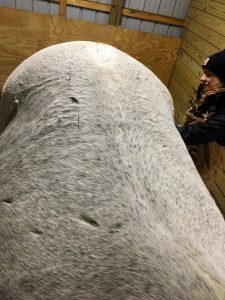 At the end of five dry needling sessions, the patient remained a grade 4/5 lame on the left hind limb and a grade 1/5 lame on the right front limb. However, as described in the above pre-treatment exam notes, the patient’s flexibility, mobility, and comfort were drastically improved. Quality of life was augmented as evidenced by the change in the patient’s overall demeanor and marked increase in activity level at pasture. These changes can be attributed to dry needling alone, as no other treatment modalities were performed. There were no adverse events directly related to acupuncture, although the patient’s front end lameness did periodically worsen. This was likely related to over-use injury, unmasking of a secondary lameness as hind end pain was alleviated, and the heel bulb laceration sustained in pasture. Over-use may have been secondary to the decrease in pain and increased mobility related to acupuncture. With needling targeted at relieving pain in the front end and time for the heel bulb laceration to heal, the front end lameness improved to the slight lameness seen initially. This case supports previous evidence that acupuncture is a beneficial and worthwhile treatment for chronic pain. This case also illustrates the changes in stride that can be achieved through acupuncture. As demonstrated by this case, pre-treatment evaluation is an important part of each treatment, as small changes in patient status can help guide needle placement to achieve the greatest benefits. Introduction of other modalities, including electroacupuncture or photomedicine, may increase patient response, but treatment of this patient with dry needling alone speaks to the validity of this modality. 2. Acupuncture and Chinese herbal medicine for treating horses. Shmalberg, Justin et al. Compendium: Continuing Education for Veterinarians, May 2011.